Panel glide systems combine the elegance of curtains with the functionality of blinds. Fabric panels fall vertically from the track giving the soft look and feel of a curtain. The fabric panels overlap to eliminate light gaps and stack either right, left or to the centre. 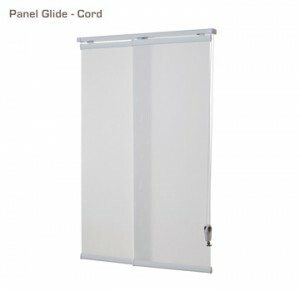 Panel glides are an ideal choice for sliding doors. The Panel glide system track can be operated by wand or cord and is available in many different operating configurations. In conjunction with the various fabrics on offer, it provides control of light, privacy and vision out. Verosol’s panel glide system is available as a 2, 3, 4, or 5 panel track system in clear anodised, white, black, or white birch powder coated finishes. Tracks can be custom powder coated at a surcharge. Control and configuration options include an extensive range of 24 different track configurations and stacking options available. Helioscreen’s panel glide system is a versatile multiple tracking blind system, which retains your outlook while ensuring maximum privacy and UV protection. See the Helioscreen panel glide brochure for more information. Light and easy to operate, flat panels of fabric simply glide across the window surface, giving complete access to views and doorways while maintaining the clean lines of the window. The Panel Glide is available in a stylish range of translucents, sheers and designer prints exclusive to Helioscreen. 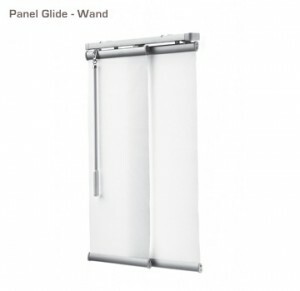 The Panel Glide can be operated either with a cord, wand or simply by hand and carries Helioscreen’s 5 year warranty.